Atmosfäärilised helilained Mick Pedajalt ja duolt Coals (Poola). Helge talveõhtune rännak kunstimaailma. Atmospheric sound waves from Mick Pedaja and Coals (Poland). A touching winter journey into the world of beauty. 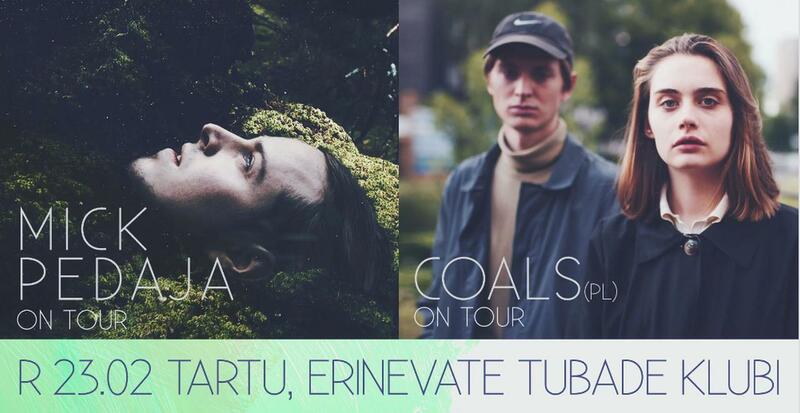 Coals is young duo from Poland.Coals are inspired by artists such as Spooky Black, Soap&Skin,Dean Blunt and Sigur Ros. An exclusive British magazine The Quietus about Coals: "The somewhat creamy quality of Coals' music is an experience akin to being wrapped up in cotton wool and sailing away on ebb tides of unperturbed bliss."